Maintaining a stable water temperature in your saltwater tank is important for the health and well-being of your fish. Read more to learn how to combat common problems with heating in saltwater tanks. When it comes to maintaining a healthy saltwater tank, you have probably heard about the importance of filtration and maintaining high water quality. While both of these things are very important, that is not to say that other things like heating are less important. 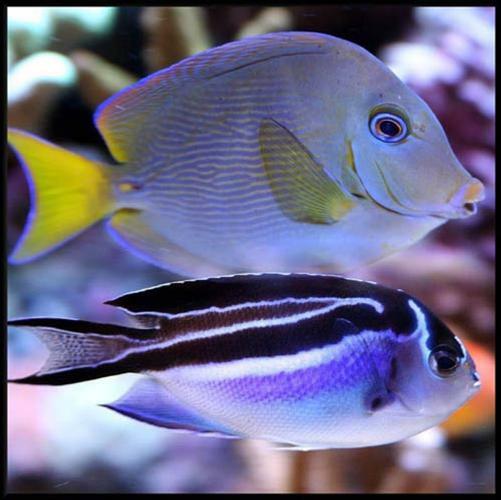 In order to keep your saltwater aquarium fish healthy, you need to maintain a stable water temperature in your tank – while some species may tolerate a wide range of water temperatures, many will become stressed if the tank temperature fluctuates too greatly. This article will familiarize you with common problems regarding heating a saltwater tank so you will be better equipped to deal with them, should you have to. If the temperature in your tank varies by a degree or two over the course of several days, it is unlikely to be an issue – if the temperature fluctuates by several degrees throughout the course of a single day, however, it could cause your fish to become stressed. When fish become stressed, they become more susceptible to disease so it is extremely important that you maintain a stable water temperature in your tank. One of the most common causes of fluctuating tank temperature relates to water changes – if you do not make sure that the temperature of the water you’re using to refill the tank is the same temperature as the tank itself, you could have trouble with fluctuating tank temperature. Another possibility is that your tank is exposed to direct sunlight. If your tank is positioned near a large window or skylight, exposure to direct sunlight could change the temperature of the water in the tank throughout the course of the day. One final possibility is that you do not have an aquarium heater installed at all – if you have done your research prior to setting up the tank this should not be the case, but if you are new to the aquarium hobby you may not realize the importance of a tank heater until you experience problems with controlling the temperature in your tank. It is possible to have a high-quality aquarium heater installed in your tank but to still experience problems with maintaining a stable water temperature. In some cases, it may simply be an issue of heat distribution. The first thing you need to do in resolving an issue with uneven heat distribution is to determine that the heater you have installed is the proper size for your tank – if the heater is too small, the water around the heater is likely to be the correct temperature while other areas of the tank might be too cold. Another thing to consider is the position of the heater – if you have it positioned near one end of the tank rather than in the middle that end of the tank could be warmer due to proximity to the heater. If you are experiencing problems with uneven heat distribution you may want to consider switching to a submersible aquarium heater. Submersible heaters can be submerged directly in the tank, installed horizontally along the bottom of the back wall for maximum heat distribution. There are several reasons why your tank might be overheating so, before you can resolve the issue, you need to determine the cause. The most common cause for overheating in a saltwater tank is the lighting system – if you have a high-powered lighting system such as VHO or metal halide, the heat produced by the lights could be affecting your tank temperature. If this is the case, you may need to install an auxiliary fan or aquarium chiller to counteract the heat produced by the lights. Another possibility is that your tank is too close to a window or heating vent. In this case, you may simply need to reposition your tank. If you are not able to remedy the problem you are experiencing with your aquarium heater your only option may be to replace it entirely. While you may be concerned about the cost of this necessity, you should think about it as an opportunity to improve your tank. Take this chance to invest in a high-quality heater that is rated for your particular tank size so you do not have problems in the future with uneven heat distribution or temperature fluctuation – you may even want to purchase a larger heater than you need in case you decide to upgrade to a larger tank at some point. You should also consider whether you want to purchase a hang-on, submersible or in-line heater. Hang-on heaters are very easy to use but submersible heaters often offer better heat distribution. In-line heaters are a great option for saltwater tanks because they can be installed in a sump system and will keep the temperature in your tank even. Before purchasing a new heater, do a little research to see what your options are and what model might best suit your needs. You may never experience any of these problems in your saltwater tank, but it is still wise to familiarize yourself with this information so you know how to deal with the problem if it occurs. Half of maintaining a thriving saltwater tank is research and preparation – the more you know, the more successful you are likely to be as an aquarium hobbyist.